CEDAR FALLS (KWWL) - Alex Headington wanted a marriage proposal that his girlfriend Vanessa Schipper could brag about to her friends. It is safe to assume that he accomplished his mission. 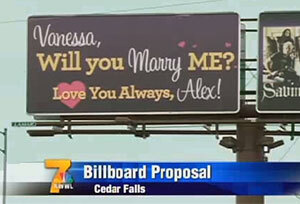 The sign, located near the corner of University Avenue and Cedar Heights Drive in Cedar Falls, reads "Vanessa, Will you marry me? Love you always, Alex." Headington called Schipper while she was at work, telling her he had a surprise. Schipper agreed to go along with Headington for a drive. After he pulled up to the sign, Headington got out of the car with Schipper, dropped to a knee and proposed. The couple met while working together at Sears. Schipper admits that she couldn't resist her now-fiancee's charm. Watch the original segment that aired on KWWL.